Sun Ra's music is likened to that of Duke Ellington, but with a more radical bent. Wayne Hiebert, The Ottawa Citizen / Three members of Rake -- Rob Frayne, Shara Weaver and Linsey Wellman -- get into the spirit in a rehearsal before the concert honouring Sun Ra and his music. The insular world of Alabama pianist Herman Poole "Sonny" Blount seems so odd, so distant today -- seven years after his death --that describing it seems like knitting an urban myth. How do you begin discussion of a man who insisted that he was from Saturn, that his music was influenced by the ancient Egyptians, and that he could transcend death? Harder still, how do you capture the essence of music that spanned 20th-century African-American culture from boogie-woogie to doo-wop to avant garde jazz? The latter task is the challenge to be undertaken Tuesday at The Mercury Lounge by a dozen Ottawa performers who come to the music of Blount -- or Sun Ra, as he preferred to be called -- from very disparate backgrounds. The group includes telecommunications policy consultant Gaby Warren, jazz saxophonist Rob Frayne, new music cellist Mark Molnar and dancer Shara Weaver. In the true spirit of Sun Ra, who believed that musicians had to "unlearn" theory to play his music, a number of the participants are coming to the composer's work for the first time. At the centre of this tribute to one of jazz's least understood pioneers is the improvising trio Rake, which has just released its debut CD on Spool Records. Along with Frayne, Rake members David Broscoe, Rory Magill and Jamie Gullikson have spent weeks working through a number of Sun Ra's compositions, reharmonizing them where necessary and arranging them for the somewhat unusual collection of musicians that includes six saxophonists but no trumpet, keyboard or guitar. Sun Ra would've appreciated that the project had its genesis on the Internet. "Someone on the Sun Ra mailing list was selling lead sheets of his music to help raise funds to repair his band's house in Philadelphia," says Broscoe. "So I got this huge bundle of music in the mail one day and figured I had to do something with it." 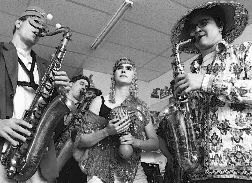 Broscoe, an instructor at Algonquin College, began to play some of the songs at jam sessions with fellow saxophonist and sometime music promoter Bernard Stepien (who brought Sun Ra to Ottawa in 1990). He also began to work some of the pieces into his improvisations with Rake. The germ of an idea to do an entire show of Sun Ra's music quickly spread outside the trio to frequent collaborator Molnar, and then to Frayne and beyond. "Rob was incredibly enthusiastic about the project," says Magill, "and he quickly brought in others like Linsey Wellman and Gaby Warren, who studies music with him. Rob is our equivalent of Sun Ra's longtime saxophonist John Gilmore; he brings some real jazz credibility to the group." "Sun Ra always liked to have a combination of musical slackness and virtuosity in his bands," says Broscoe, "and this group captures that same mixture." Some of the players, like Stepien, are part-timers who play for pleasure, while others, like Frayne and Gullikson, teach and play on a regular basis. Magill, who works days at the Andrew Fleck Day Care Centre in the Byward Market, is best known as a percussionist, but he's also doubling on trombone for the Sun Ra material. "I've never played trombone before, but I'm enjoying the experience of fitting it into this music. We are really trying to approach Sun Ra's music with as much feeling as musical chops." Magill, who has an extensive background in West African music, cites African culture as a dominant influence on Sun Ra. "There is a genuine feeling of community in this music, which is evident in Sun Ra's frequent use of dancers and his inclusion of anyone who wanted to play his music, regardless of the musical ability they brought to it." Okay, so where does Saturn fit into this picture? In the late 1940s, during a five-year stint as arranger and rehearsal pianist for Fletcher Henderson's band in Chicago, Blount became increasingly obsessed with Egyptology and the possibility that Earth had been visited by travellers from outer space. He began calling himself Le Sonny Re or Sonny Ra, and in 1952 legally changed his name to Le Sony'r Ra. In one respect, Blount was following the grand tradition of black jazz performers by establishing a memorable stage name, but over the next 40 years, a mythology grew up around his secretive and occasionally prickly refusal to discuss his Southern roots. Sun Ra insisted that his musicians live communally -- first in Chicago, then in New York's East Village, and finally in Philadelphia. He clothed them in glittery, hand-made "space" costumes, and called them names such as the Solar Myth Arkestra, the Intergalatic Research Arkestra and the Asto Infinity Micro-Ensemble Unit. Dancers improvised tribal rituals, and the entire band would parade through the audience chanting, "We travel the spaceways, from planet to planet." Decades before Jimi Hendrix and Sly Stone dressed outrageously and preached peace and love, Sun Ra was a well-established entertainment commodity in the black community. It would've been nothing more than a colourful show if the music hadn't been extraordinary. In fact, much of Sun Ra's music can legitimately stand beside Duke Ellington's, albeit with a much more radical bent. Certainly, Sun Ra's output -- close to 1,000 recorded compositions -- rivals Ellington's, without even taking into account the eccentric doo-wop and R&B tunes his band cut to make money in the '50s. 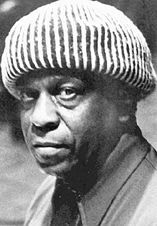 There are echoes of Ellington's use of colour, although Sun Ra -- an early proponent of electronic instruments -- was always pushing the boundaries. "I love the harmonic palette he creates in his music," says Magill. "He really had a knack for distorting the Swing tradition and turning time signatures into rubber." "Some of it is very tough music," adds Broscoe. "Other parts, like his frequent use of a bass ostinato, can seem simple, but it all depends on how it's played. There is a very unique layering of time in his music, as well as very distinctive chromatic motifs." The Sun Ra tribute is Tuesday at The Mercury Lounge, 56 Byward Market St. Tickets are $7 in advance at the Mercury or at the door. Show time is 8 p.m.